The festive season may be gone, but that doesn't mean we have to stop bringing in red tones to our makeup looks. I'm a fan of a cat eye, big or small, any day of the week, and lately I've been using the Scout Cosmetics Liquid Liner for my daily look. The formula of this product helps it slide on smoothly and the applicator allows me to get a nice pointy line. With the Australian weather constantly changing from a state of heatwave to cool winds and rainy days, our skin coops a lot year round. 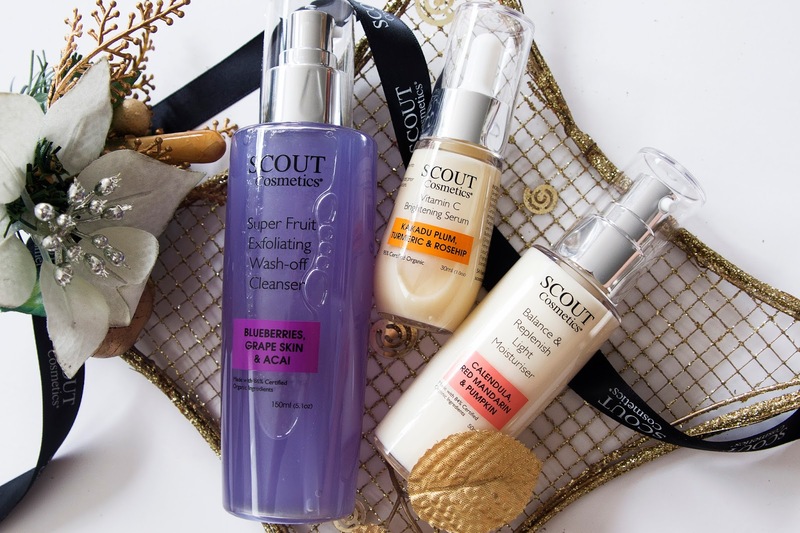 This means that having some good skincare by yourself is always a must, like this trio of products from Scout Cosmetics. Starting with Blueberry Super Fruit Exfoliating Wash-Off Cleanser, this is a gentle cleanser which I think most people could use on the daily without to many issues (always do a skin patch test though before using something new). This cleanser contains organic blueberry extract which helps protect your skin against damage from the sun, pollution and other environmental stresses. It has contains grape skin extract which is a super powerful anti-oxidant which that help strength the cells in our skin, as well as açai berry oil (yep, like that stuff you eat) which has a packed full of various vitamins and other minerals to give our skin a soaking in refreshing goodness. The Vitamin C Brightening Serum, which is 95% certificated organic. This serum contains turmeric to help keep your skin feeling soft and glow, Kakadu Plum which helps to brighten your skin and reduce the appearance of fine lines and wrinkles, and the Rosehips helps to plump up your skin and give it a youthful look. Lastly, the Balance and Replenish Light Moisturiser, which I love to use in my morning skincare routine because it's light formula means it doesn't interfere with any makeup I put on, and it's packed full of benefits. This moisturiser contains Calendula, which helps to soothe and calm irritated skin and helps prevent redness, a combination of Mandarin, calming Lavender and anti-bacterial Bergamot essential oils which help to revitalise the skin, and organic pumpkin oil which helps your skin maintain moisture and keep on looking fabulous. I've been loving these products! The nail polish is such a beautiful shade!! Ooooh I LOVE the sound of that Vitamin C Brightening Serum.